Start making plans now to attend the annual spring antiques and collectibles show at Maquoketa Flea Market in Maquoketa, Iowa. Held on Sunday, April 28th, this family friendly show will take place at the Jackson County Fairgrounds. There will be plenty of treasures to rummage through, so you don’t want to miss this! For over 35 years, the Maquoketa Flea Market has been one of Iowa’s largest flea’s with over 150 exhibitors selling a vast array of antiques and vintage items. Buyers and vendors all over are welcome to attend and add to your collections. Antique dealers can visit their Facebook page at https://www.facebook.com/Maquoketa-Flea-Market-Antique-Show-148600089066515/ if you are interested in selling at the show. 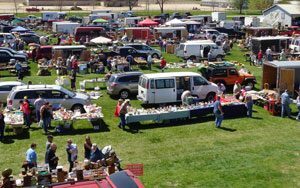 The Maquoketa Flea Market Spring Show will be open from 8:30am to 3:30pm. Parking is free and admission is only $4, while children 10 and under are free. For anyone who wants to get a head start, early bird shoppers are welcome between the hours of 6:30am and 8:30am. Early bird admission is $10 per person. For more information on the show, feel free to visit their Facebook page or call 319-462-0135.